I was watching Food Network yesterday and Guy F. was visiting Hawaii and talking about the plate lunches that are popular there. 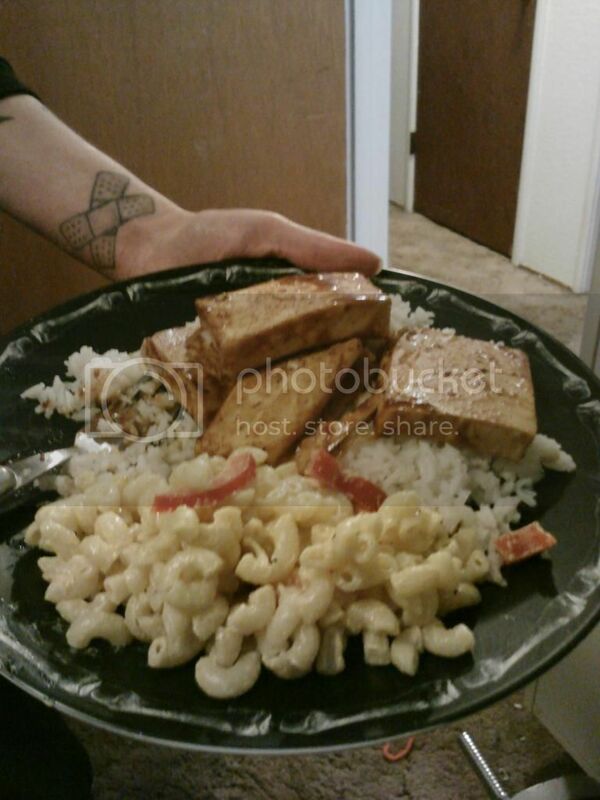 I was curios because it is white rice, macaroni salad and a protein. It seemed odd, comforting and carby. A winner! We have white rice (in this case organic basmati), a basic macaroni salad that has red bell peppers and for our protein portion we have pan grilled BBQ tofu slabs! It was really good and perfect for a rainy, cold, PMSy night in! That was Matt's plate - he approved! I tried keeping the macaroni salad on the plain side because adding onions (I did add onion flakes though) would not make him happy!